Home Guides & AdviceAdventure Travel	A Week Morocco: All You Need to Experience! Morocco is a safe, beautiful, splendid country. The people in Morocco are kind, the food delicious. A week-long vacation in the country really isn’t enough, but with this 7-day itinerary, you can experience just enough to want to go back! To be honest, Africa in my (rather ignorant) mind has always been a region populated by wild animals and natural habitat. Of course, I knew there’d be big cities and urban living. But the thought of a country like Morocco, with its Arabian influences, has never crossed my mind. Alongside India and Colombia, Morocco has become one of my favorite destinations. With its magnificent architecture, welcoming people and lavish lifestyle, I often miss the days sipping overly sweet mint tea and jogging around maze-like medinas. A week in Morocco really isn’t enough to experience the true nature of this charming country. However, it may just be the perfect length to have a taste of what this vibrant destination has to offer. From Chefchaouen to Marrakech, here are some things you really should see/do for a week in Morocco! Although Morocco sits in Northern Africa, the weather is a bit chiller than I expected. During my week-long trip at the end of Feburary, I ended up purchasing a small sweater to brace the cold. Nonetheless, summer in Morocco can reach a temperture of 30 degrees celsius on a daily basis. As such, Spring (mid-March to May) and Fall (September to November) are the best times to visit Morocco. Yes! I thought Morocco was perfectly safe, especially for those on vacation who wish to travel with a tour group. I never once felt uncomfortable when walking alone in the streets or eating out at night. Of course, most of my time was spent with my friends. But truth be told, people in Morocco were so kind that I wouldn’t hesitate to visit by myself! Chefchaouen is a destination north of Morocco. The whole city is in varying shades of blue, a color said to have the magical power of repelling mosquitoes. As the capital city of marijuana production, it was offered everywhere. People rolled joints in little cafes by the streets and sold them by the bundle. The city was founded in 1471 in an attempt to fight against the Portuguese invasion of northern Morocco. 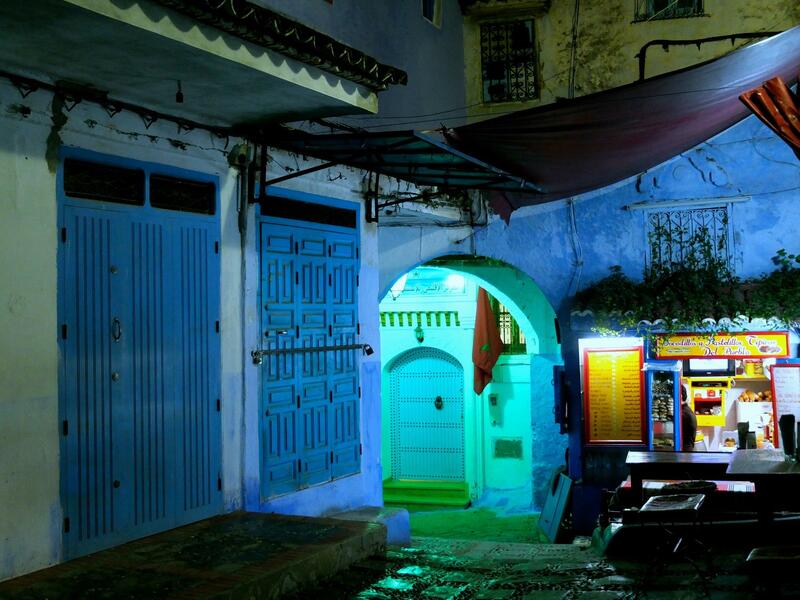 Chefchaouen was only returned in 1956 after the liberation of Morocco from Spanish colonization. The city was small. We were able to tour the town within a day and even had time to hike up a Chefchaouen Ras Elma for the full view of mismatching blues. Although the whole town is colorful, some of the most visited areas are Souika, Bab El Sor, and Rif As-Sabanin Oven. While we felt safe in a group of 9, our guide did tell us to be extra cautious at night. Fez is the oldest of Morocco’s imperial cities, with a medina that extends back to the thirteenth century. From splendid palaces to religious sanctuaries, the city is often called “Mecca of the West.” Its artisans and activities are spread across maze-like bazaars. We began the day by visiting the Royal Palace of Fez (Dar el Makhzen). While the gardens of the palace have restricted access, the magnificent gates were worth the visit. After visiting the palace, we were driven across the city towards Fez el-Bali. This ‘old wall’ provides a great view of the whole city. Although it is not difficult to find, a tour guide is highly recommended. The sprawling streets and constant hustle of Fez were really confusing. There are no words to describe the incredible experience of lounging in the middle of the desert overnight!! The starry nights and light drinks, the Moroccan food and Barbar talks, loved it through and through. Despite how cold the night was, it was while worth the chats in the sand. Following our two-day stay in Fez, We went through the Cedar Forest, the Port of Midelt, Errachidia Reservoir, and the Valley of Ziz towards Erfoud, the city to our desert stay. We weren’t able to stop at every location on the road, but if you are on vacation and have the time to pull off a road trip, do follow this ultimate itinerary! I really can’t stress how different the landscape and weather between the various Moroccan regions can be. At one point, we had mountains full of snow behind us while heading towards eye-distant desert! We spent the fourth night in the middle of the desert with some Berbers. They were happy-go-lucky people that drummed and danced with us the whole night. The night was completed by millions of stars, a bottle of wine, and a tribe of camels dozed a few feet away. Alas, the February night sky was bone-shattering, so we spent the rest of the night crawled up in sleeping bags on mattresses inside pre-prepared tents. This is where movies like Lawrence of Arabia and The Mummy were filmed. The set is still intact, and there weren’t many tourists around the area. Unfortunately, our itinerary only provided an hour or so here so I didn’t have the chance to go inside. But if you are on vacation and decide to visit the area, do yourself a favor and explore the city! By mid-afternoon, we were on route to Morocco’s crown jewel–Marrakesh. Marrakesh, Morocco is as lively as you’d think a metropolis can be. It buzzes with life day and night, with thousands of henna artists, hustlers, musicians, tourists and vendors strolling through the old city center. There was an infinite number of cuisines. The city center provided western cafes, traditional Moroccan tea shops, Chinese, curry, steak, you name it. I’ve always thought that Italy was home to the best pizza, but it definitely has some competition in the markets of Marrakesh. One of my favorite places was Bari’s Pizza. They are located just at the outskirts of Jemaa El Fna (main square). Their margarita pizzas are amazing :’) Morocco also makes a mean avocado milkshake, which is basically heaven’s gift to earth and a must have! No need to say, a week in Morocco was not enough. For 6 days including ground transportation in and between cities, accommodation at beautiful riads (mini palaces) with half board (breakfast and dinner), excursion in the desert (camel, tents, and entertainment) and transfers to airport, we each paid €200. Considering the amount of traveling, we definitely got a bargain deal! The rest of the money I spent was in bazaars. I couldn’t resist the temptation of buying supposed cashmere scarves and cotton shirts. If I could, I would have gotten a Moroccan rug as well! They are wonderful. If you have questions, feel free to shoot me a message! Or, read my 5 must-dos in Morocco! Hi Daisy! I’m planning a week to Morocco and would like to cover Chefchaouen, Fes and Marrakech too. Could you share your itinerary with me, please? Hey, Daisy. Not sure if I missed the email. Could I trouble you to send the itinerary again please. So sorry! Hi there! If you’ve yet to receive it, I’ve also just posted the entire itinerary online! 🙂 Enjoy Morocco! This is such an uplifting read. I spent 4-5 days in Marrakesh last year and was a bit disappointed. I think a mix between building it up slightly too much in my head, plus it was really tricky being a blonde tourist there for my in low season. Saying that, you’ve restored my faith! The Merzouga Desert looks right up my street, so hopefully I can venture there and Fez and see something new. Definitely depends on what you are into as well! I love rich, colorful cultures, and have always thought Europe to be a bit too proper for my liking. After living in Paris for a few months during its gloomy snow season, Morocco was like breath of fresh air!! I love your photos. Morocco looks so beautiful! We were supposed to be there this month, but my 5 year old really wanted to see the Eiffel tower so we went there instead. It’s still high on my list of place to visit and your blog certainly makes me want to go soon! I love your post, it makes me want to go to Morocco again! I sadly only stayed in Marrakesh and Essaouira but I remember thinking: wow now I’ve been to Africa too. It felt more like a part of the Arab world, but I was still very excited. I’d love to go back and lounge in the desert! Looks so amazing. I’ve wanted to go to Morocco for so long and just haven’t made it, even though I lived so close in the south of Spain for a year! This just makes me want to go even more. I love your photos, and some of these places I hadn’t thought about so I’ll have to add them to the list! You managed to fit so much into your week in Morocco! We had 4 days in Marrakech and just about saw everything we wanted to see – I couldn’t imagine covering all this distance in such a small amount of time – but good on you for doing so. I always thought I packed a lot into trips but you’ve showed me I could do much better! Morocco is one of my dream destinations. When I was in Europe I did come across a cheap flight to Marrakesh. But unfortunately it was too soon and I couldn’t have got a Visa by then! 🙁 Too bad I missed Morocco. I have never been to Morocco but it has always intrigued me. I have been to Jordan and I would like to believe it is somewhat similar and yet different. Really.. thanks for starting this up. Someone with a little originality! Hi Daisy. Planning in a trip to Morocco this September/October and would be interested in having the name of your tour operator/local guide used on your trip. It’s our first time to morocco. Hi! Amazing pictures of what seems to be a great experience.could you please confirm if you booked the tour upfront, prior to reaching there?Did you know the 9 people in your group and you booked together? Thank you! Hi Daisy, thanks much for your quick response! Could you please also provide the name of the company you travelled with and if you do recommend them? Much appreciate your help! This sounds awesome! I’m trying to figure out how to do a few days in Morocco when we’re in Spain next month. Do you have the name of the tour company you used (or any other helpful info)? Thanks!